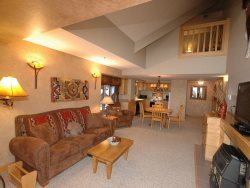 This spacious, beautifully appointed, newly decorated, chalet has over 1800 sf of pure comfort. Plenty of room for 8 people has an open floor plan with cathedral ceiling with several large windows to enjoy the beautiful views. Hot tub and BBQ located located on the patio off of the living room sliding doors. This chalet is conveniently located to nearby dining, groceries, shops, bakery, massage, movie theatre, galleries, liquor store, and free concerts in the park during the summer months. OUTDOOR ENTHUSIAST: This Chalet is the PERFECT location for your Yellowstone Park and mountain adventures. SUMMER activities: This chalet is walking distance to hiking and biking trails. Nearby to famous Gallatin River fly fishing, white water rafting, horseback riding, and golf. WINTER ACTIVITIES: This chalet is less than 10 minutes away to some of the biggest and best skiing in America. Over 5500 acres of ski terrain between Big Sky Resort and Moonlight Basin: 24 lifts and 220+ trails. You will enjoy the lack of lift lines (in comparison to other ski areas) and the amazing terrain. Snowmobiling in West Yellowstone and the wildlife adventure is 45 minutes away. During the winter months a few shuttle will drop you off within steps from your door. This chalet has 3 bedrooms with 3 en-suite bathrooms. * Master Suite (Upper Level): Queen sized bed , large walk-in closet, En suite bathroom with his/hers sinks, and a large shower. * Guest Bedroom (Upper Level): Queen-sized bed and Twin-sized bed with En suite full bathroom. * Guest Bedroom (Main Level): Twin-sized bed with added Bunk bed with a full bathroom just outside the bedroom door. This chalet has all the features for the cooking enthusiast. This kitchen has every convenience need and is fully equipped, includes entertaining bar with stools. Right off the kitchen is a beautiful dinning room with seating for six people. * Free Shuttle Service to the steps of Big Sky Resort The owner and property management company reserves the right to make any modifications or changes to the listing, rules, policies, agreements, and rates at any time.